Not a single Senator or Representative in Congress has spoken out against this persecution of Muslims. Not to be outdone on brain inactivity, a Kentucky Congressman is proposing a bill to make it easier to own guns in Washington, DC., because if everyone owned guns, the killer would not have succeeded in shooting the people. Of course, the killer’s success is a whole lot easier if the killer-to-be is not Muslim because they are looking for us Muslims, not REAL American “Judeo-Christians”! Lewis Carol was prophetic when he wrote ‘Alice in Wonderland”, the world does stand on its head. The Queen has the power to kill and do all sorts of terrible things because she is Queen. Our President/King (“TRUMP” card) acts in much the same way and while the Republican side of Congress is in full goose-step with him, the spineless side (Democrats) are too fearful of being called “soft on ‘Trrrsm’” to say anything. To be pragmatic, the targets are Muslims, Muslims have no political profile of strength and it is fashionable to bash Muslims if one wants to show strength or patriotism so, what’s the harm? People are getting bolder in trying to out-do each other in showing their hate and stoking fear against Muslims, to the total silence of our political leaders who are far too busy currying favor and collecting blood dollars from their paymasters, to worry about us Muslims. This is true patriotism; when people take brave stands against Muslims, make claims against us that would not pass the reasoning powers of an insect and our leaders…Senators… nod wisely in agreement. Such was the case when “experts” gave testimony in the Senate hearing on Extremism. According to them, Muslims had already established and enforced “Sharia Law” in some parts of the US and now Muslims were planning to reproduce at a rate that soon, we will overwhelm the population of this country as well as populations of other Western countries. 3-4 million American Muslims will grow to more than the rest of the over 360 million non-Muslim Americans and take over this country. while 4% to 10% Muslim populations in many European countries will out-produce the other 90%-96% to take over Germany, France, Britain and all other European countries. The self-serving opportunism of the leaders of this country is breath-taking. The Gun-Lobby OWNS Congress and thus, there can be no questions raised about gun-violence (easier to probe the “Muslim threat”). According to ‘The Scientific American’ (May 2017), over a 40-YEAR period, the combined number of people who died because of Cholera, Diphtheria, Polio and Rabies, was 2,000 and the number of NIH (National Institute of Health…funded by Congress) grants issued in the same period for them was 486. The number of people shot in the US in the same period? 4 MILLION. The number of NIH grants to study gun-violence? Three. Congress has made certain that the NIH knows where its money comes from. I can’t even begin to speculate how many BILLIONS of dollars Congress has spent in search of “Muzlem Trrrrsts” in the past 16 years alone. In Germany, there were a minority of loud people who fanned the flames of hate and fear against the Jews. “They breed like rats!” said the persecutors but the majority remained silent because the entire issue was so absurd. The target population (Jews) remained silent and under cover because they thought this storm would pass; it did. Like Katrina passed over New Orleans. 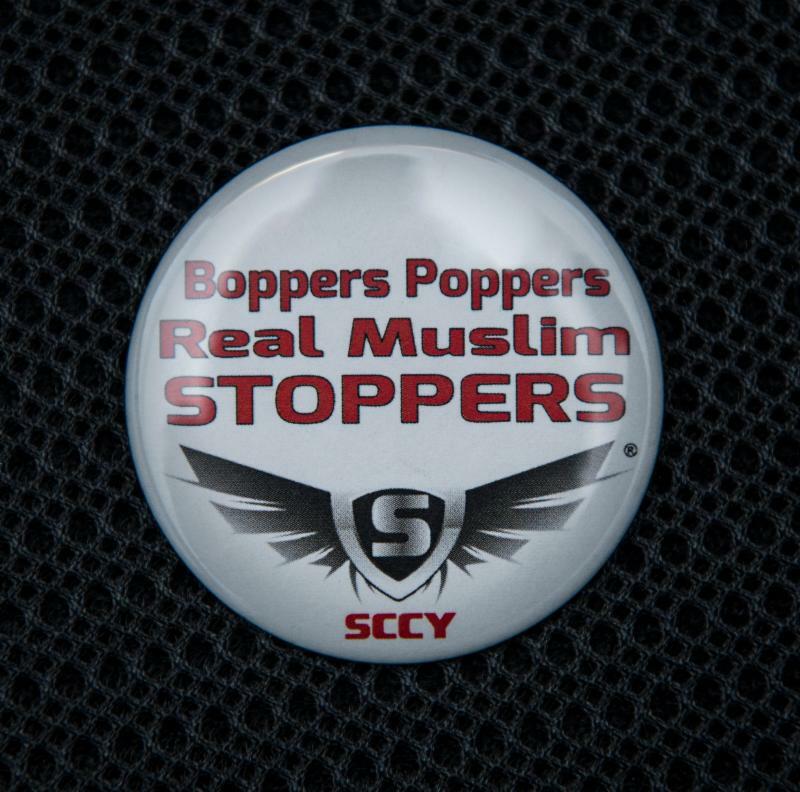 Just a few weeks ago, an SCCY Firearms, a Florida arms manufacturing company distributed buttons saying, “Boppers, Poppers, Real Muslim Stoppers”. To date, no Politician has thought it fit to say a single word against this company but wait until next year when they are electioneering and watch how defiantly they speak about being at the forefront of defending Muslim rights. This, in a country where saying something negative about the President on air, is a career-ending move. FBI is targeting innocent Muslims in hopes of making a catch somewhere, rather like firing a shotgun into the bushes in hopes of bagging a pheasant. Nevertheless, it’s good for the budget and it’s good politics. Immigration and Customs agencies are targeting Muslims probably because they are bored stiff and want to feel powerful by making others cower. They are protecting the nation! People with low self-esteem are marching around with guns and masks so they can display their patriotism and feel really strong…people who would defecate in their pants if a Police officer started to question them in normal life. Nothing is absurd when people remain silent. Nothing is impossible when there is no resistance and nobody can take the lead, when there are no determined supporters.